We at Dieselor are professionals in trading and delivering fuels for transport, agriculture, manufacturing and heating. The company offers its customers wholesale and retail services through its petrol stations, transport and fuel supplies in place. Over the years we have focused our efforts in offering high-quality low sulphur diesel (Euro diesel), corresponding to EN 590 standard. This fuel was produced to meet the demanding needs of diesel engines at any time. Today, we offer A95H gasoline, diesel B6, diesel fuel of the highest class - Topdiesel, specially produced for the most demanding users, LPG and, diesel without bio component and low excise diesel for heating. The beginning of the idea of creating Dieselor was set 20 years ago, in 1995 in Plovdiv. Six years later the company was established in Sofia. The family of the company currently counts 50 people, who are dedicated to their work in Dieselor. 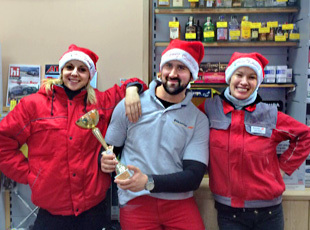 Dieselor is looking to hire a gas station sales assistant in petrol station Dieselor in Plovdiv. The company is licensed to operate, sell and transport fuels. Dieselor meets all legal requirements and has all the necessary documents for carrying out its activity, namely wholesale and retail trade of fuels. Our customers value the reliability and safety we provide them with. We work with leading transportation and construction companies. Links to suppliers, government agencies, manuals and partners.